Applications: Non-woven materials, technical textiles, automotive interiors, geo textiles, sports wear, gloves, table cloths, disposable medical gowns, non-woven masks, material slitting, etc. 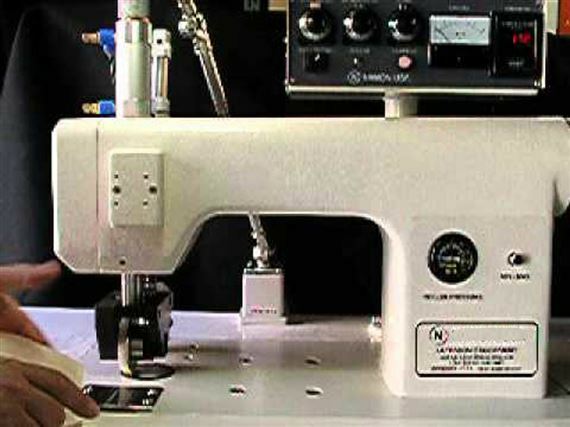 Uses Ultrasonic energy to weld, slit, cut, seal, emboss, seam (ultrasonic sewing ), punch holes, etc. New modern VCO style generator. Speed controls mounted on head for operator convenience. Pneumatic pattern and puller roller lifts. Sewing machine type treadle control for operation and pattern roller lift. Separate latching pedal for pneumatic puller lift. Accurate and durable alloy pattern roller. Custom pattern roller designs at no extra charge. Many pre-designed pattern rollers to choose from.